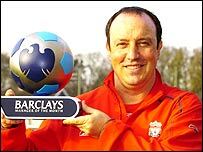 Liverpool boss Rafael Benitez has won his second consecutive Barclays Premiership Manager of the Month award. Benitez bagged the award again after extending his side's winning run to 10 matches in December. Home wins against Wigan, Middlesbrough, Newcastle and West Brom as well as a victory against local rivals Everton kept up Liverpool's 100% record. Benitez took over at Liverpool in 2004 and steered them to a historic Champions League title last season. Victory over West Brom on New Years Eve was the Reds' 10th Premiership victory in a row, the second longest winning sequence in the club's history. Benitez becomes one of only a handful of managers to win back-to-back awards. Others include Wigan's Paul Jewell in September and October, Kevin Keegan at Newcastle in 1995, Joe Kinnear at Wimbledon in 1994 and Manchester United's Sir Alex Ferguson in 1996.